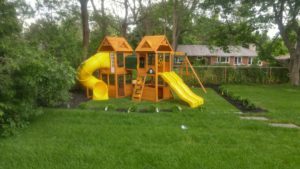 An Artificial Grass surface is a safer and more attractive option for playgrounds than traditional pea gravel, sand or other hard surfaces. Our Artificial Grass is Fall Height safe up to 12 feet and ASTM F1292 and IPEMA certified for safety. Made with a blend of polyethylene monofilament fibres, the surface is long lasting, anti-microbial and soft under foot. All of our grass is created with engineered drainage holes and raised weave channels to allow the surface to dry quickly and have kids out playing and enjoying their playground right away!